Springtime in Wichita is a truly lovely time of year. For a precious few weeks, we're (usually) done with ice storms and bone-chilling winds, but (usually) still free from sweltering humidity and swarms of mosquitoes. The rising temperatures and longer days practically beg you to get out and explore! For me, there's no better way to enjoy the beautiful spring weather than with a nice long walk. Not only does walking offer incredible benefits for your physical and mental health, but the slower pace allows you to appreciate the little details of our amazing city. 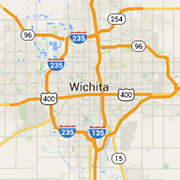 Here's just a few of my favorite places to wander through Wichita. Heavenly Historic Homes: When the Riverside neighborhood was founded in 1886, its developers had the goal of making it the most stylish area in Wichita. With inspiration like that, it's no surprise that Riverside is one of the city's premium spots for fantasy house hunting. The homes here aren't just a gorgeous backdrop for your walk - they're historically significant too, and several are listed on the National Register of Historic Places. Although the B.H. Campbell House at 1155 N River Boulevard (also referred to as Campbell Castle, or simply The Castle, and yes - it's currently for sale) is the most well-known and definitely worth a look, you'll also want to head to the Bitting Historic District (the 1100 and 1200 blocks of Bitting street), which represents the architecture of a typical residential neighborhood in the late 1800s to early 1900s. It's also home to R Coffeehouse - stop in for a drink! Three Parks in One: Riverside Park is divided into three sections - North, South, and Central. The Central portion receives the most love, and for good reason - it features a mini-zoo with local Kansas wildlife, a Stonehenge-esque solar calendar, an interactive water fountain during the warmer months, and a walking path scattered with informational plaques to take you around it all. But if you want a change of pace, take a small detour to the south, where you can pause to watch tennis players on the courts or rowers setting out on the river, or to the north, where you can enjoy a sweet little pond and the irresistibly Instagrammable architecture of Park Villa. All three sections are perfect for a leisurely weekend stroll - just watch out for the goose poop. He's a Keeper: The Keeper of the Plains is a 44-foot tall steel scupture by Wichita artist Blackbear Bosin, located at the confluence of the Big and Little Arkansas rivers. Two pedestrian bridges let you walk out to the Keeper, making it an easy addition to any downtown excursion, and the base of the statue features educational information about the Indian tribes that settled in the area. Although the Keeper is a stunning sight at any time of day, at least once you'll want to time your walk to see the Ring of Fire, which is lit each night for a period of 15 minutes (weather and safety permitting). During Daylight Savings Time, you can catch the flames starting at 9PM; the rest of the year, get there by 7. Reflection and Remembrance: Just a short distance down the river from the Keeper, you'll find a hidden gem of Wichita: Veterans Memorial Park. This quiet park, with memorials representing veterans throughout American history, is a perfect place for a peaceful and contemplative walk. Its location also gives you a spectacular view of the unique silhouette of Exploration Place, just across the river. Are You Afraid of the Dark? : Located at 29th and Woodlawn, Chisholm Creek Park is home to the Great Plains Nature Center, as well as 2.5 miles of paved trails surrounded by prairies, wetlands, ponds, and woodlands. Even if you've been to the park before, you can see it in a whole new light by attending one of their Full Moon Walks, a guided nocturnal nature hike followed by stargazing, thanks to volunteers from Lake Afton Observatory and the Kansas Astronomical Observers. Hike with a Horse, Of Course: At almost 625 acres, Pawnee Prairie Park is the largest park in Wichita, and it's also the most wild - although a paved walkway is provided, the majority of the hiking paths in the park are unpaved, winding through woods and prairies. Pests can be prevalent in the tall grasses, so take precautions against ticks to ensure that you'll walk away with nothing but good memories after your hike. This is the only park in Wichita that allows horseback riding, so be prepared to share the trails with our equine friends. Beyond the Playground: Sedgwick County Park is a Wichita favorite for family recreation, but if you head to the perimeter of the park, you'll find more than four miles of paved pathways, allowing for short strolls or more extensive excursions. The trails take you past the fishing ponds and playgrounds of the park, but also through wooded areas full of wildlife. From April through October, the Kansas Grown Farmer's Market is open right next door, so head out early on a Saturday morning and you can treat yourself after your walk with some delicious goodies from local farmers and vendors. Rails to Trails: Running along the former Burlington Northern/Santa Fe railway corridor, the Redbud Trail stretches over 11 miles through northeast Wichita into Andover and Augusta. Although it's a favorite for Wichita cyclists, walkers are welcome too. Stop and rest your feet at the "pause points" along the way, which showcase important moments and people in Wichita history. The trail starts at I-135 and Murdock and is paved all the way east to Woodlawn. Street crossings are few and far between, making it one of the few places in Wichita where you can walk for hours without constantly checking for cars. Go the Distance on Douglas: Start out on Douglas Avenue just east of the river and you'll pass by 21 bronze sculptures (collectively titled Streetscapes) by notable artist Georgia Gerber. Many are lighthearted depictions of everyday life, but the centerpiece of the collection is Soda Fountain which commemorates the Dockum Drug Store sit-in, a 1958 protest against segregation. Your journey down Douglas will also take you past the Pop-Up Park and Gallery Alley, two projects designed to transform neglected locations into vibrant public spaces. Looking to walk even further? Head east into the Douglas Design District, where you can find dozens of murals painted by local artists as part of Avenue Art Days. You can roam and explore freely, or download their mobile app or a map to guide you. Don't worry about the return trip - schedule your walk for a Saturday and you'll be able to ride the free Q-Line trolley on its extended route from Clifton Square all the way back to Delano. I'm Buggin' Out: WSU isn't just home to the incredible Shockers basketball team - you'll also find a massive collection of outdoor art. The Martin H. Bush Outdoor Scupture Collection includes 76 pieces scattered across campus. One of the most beloved is Millipede, a giant whimsical insect who's happy to pose for selfies with you. Nearby is one of the other standouts of the collection, the recently restored Personnages Oiseaux, a mosaic mural by world-famous artist Joan Miró. While you're on campus, make sure to swing by the Corbin Education Center, one of the last buildings designed by renowned architect Frank Lloyd Wright before his death in 1959. People come from around the world to see the building, but for you, it's only a short walk away. An Urban Oasis: The Art Garden at the Wichita Art Museum includes more than 20,000 plants and 13 outdoor sculptures, making it one of the best spots for a stroll in the entire city. The garden opened to the public in September 2015, so if it's been a while since you've visited WAM, you might not even know that it exists. But once you see it, I know you'll fall in love. The garden is free to visit and accessible 24 hours a day, and you'll definitely want to come by for a nighttime walk to truly appreciate Pulse Field, an installation by Derek Porter consisting of solar lights on top of tall poles that turn on and off in gentle patterns. Wichita is home to countless paths to promenade and avenues to amble, and I hope I've inspired you to lace up your sneakers, slap on some sunscreen, and get out into the city on foot! Ultimately though, the best walk is the one you actually take, so even if you can't make it out to any of my selections, there's still plenty to see and appreciate on a leisurely stroll right in your own neighborhood. Walk on, Wichita!